Nisim Nutrient Enriched Styling Gel with herbal ingredients that actually help to protect the hair, Nisim Nutrient Enriched Styling Gel keeps even the wildest tresses under control. It combats flaky scalp, hard hair and flat style. Moisturizes so your hair wont break or look dull. Sunscreens to protect your locks from the harsh rays of the sun. Nutrition with a blend of natural extracts, amino acids and proteins. 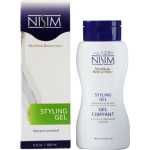 Nisim Nutrient Enriched Styling Gel leaves your hair soft, healthy, and under control. In other words, style just met substance.